The name Frankenstein conjures up an image of the booted and bolted celluloid monster with its drunken gait and toddler-like curiosity. Mute and massive he's an unpredictable tour de force destined to bring about the end of civilization. The monster's star has, of course, out-shone that of his maker, the real Frankenstein, thanks to James Whale's widely-lauded cinematic offerings Frankenstein and Bride of Frankenstein. But Whale's artistic license gave his monster a dumb, almost-comical presence, a far cry from Shelley's fearful, intelligent creature able to negotiate and manipulate to get his own way. And what of his electric-haired bride, beautiful and doomed to be on the cover of many horror anthologies to come? In Shelley's novel she was hacked to pieces by her maker before being given that final spark of life. The author gave the creature a voice but gave his bride nothing. 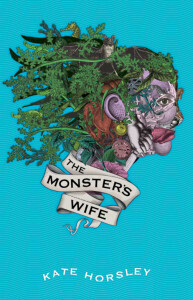 It is only now that she is given her own story, in the pages of Horsley's decadent, historical novel The Monster's Wife. When Shelley wrote Frankenstein or The Modern Prometheus, she took the doctor to the Orkneys, a set of islands off the north coast of Scotland. Here he could be left, uninterrupted, to seek out the unformed clay with which to make his bride. And it is here that The Monster's Wife is set, on the island of Hoy, where that clay once took the form of a girl, a woman, as strong and fearless as any man. This is not a sequel. Neither is it a story of a life before the doctor and his creature. Rather, it is a narrative that runs alongside the original, taking what is almost an after-thought and giving it a conscience. It is a story about friendship, courage and identity in a hostile climate. These are an uneducated people adept at deboning fish and slaughtering animals but ignorant of life beyond the island. Reliant on the sea for their livelihood, they live both in fear and in awe of her power. There are hints in fireside tales of what lies beneath, and sometimes the horrors that dwell in the darkness are brought forth to the beaches to litter the rocks. But the sea is more than a malevolent deity and its tempestuous nature is shared with the novel's heroine, Oona, and her close friend May. The bond they share arouses suspicion among the locals, who fear a witchy threat to their manly prowess. A woman should be attentive and loyal to her man, so these two wild, wilful women who do as they please are perfect fodder for the rumour-mongers. Not least when Dr Frankenstein appears and their lives become inextricably entwined with his. His foreignness, his prestige and charm draw the girls in to his world. Here is a mystery to be solved. There is fear, but there is also intrigue. Desire stirs, blood flows hot and there is a crackle of electricity in the air. It is a warm comfort compared to the sparse, cold life on the island, which Horsley describes wonderfully. As the plot unfolds we get an insight into island life. Horsley travelled to Hoy whilst researching the book and clearly brought back a wealth of knowledge and sentiment. It is a brave move to write a historical novel, though easier, I expect, if much of the land has remained unchanged for years. The topography and landscape are significant, pushing the novel along through the twists and turns of a rugged terrain, and there is a twang to her characters' diction, while her use of words such as pandybats, bannocks, laird and sadiron give the novel an authentic feel. ...and the result is a moving tale with touches of beautifully-described horror nestled in the historical back-drop of a questionably malevolent island.